Organic Maca is a rare superfood grown at 4,000m above sea level in the Andean district of Junin in Peru. Maca is a Peruvian root vegetable that contains unique alkaloids which have extraordinary health benefits such as promoting optimal functioning of the hypothalamus and pituitary master glands, which in turn improves the overall functioning of the endocrine system. The Junin district of the Andes where Maca grows is barren and treeless, experiences powerful winds and huge temperature fluctuations that often drop below freezing temperatures at sunset. The landscape can grow nothing, except that is for Maca, which actually thrives and grows to be one of the most power packed superfoods that we have access to. Maca is essentially an adaptogen that adapts to your body’s metabolism and particular needs to achieve an overall sense of wellbeing and optimal functioning. It is nutrient rich in essential amino acids, vitamins, minerals, enzymes and it contains nearly 60 phytochemicals. For Peruvians, in the Junin district of the Andes, Maca is a staple food and drink. So you can consume as much as you like and the more you eat, the more energy and overall vigour you can experience. Maca is non-toxic, has no dangerous side affects and no withdrawal symptoms. So the quantity you can take really depends on what you want to achieve. 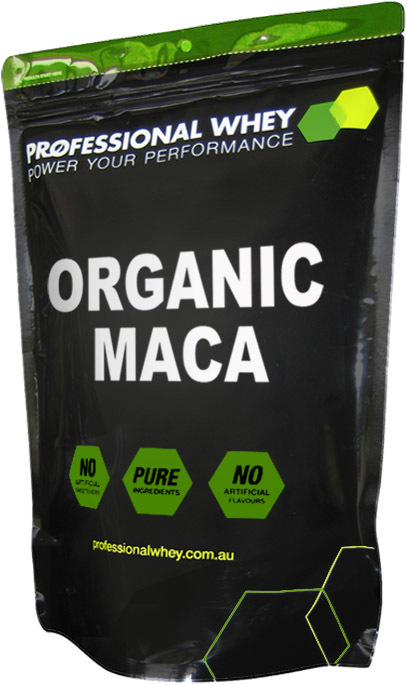 Add Organic Maca to any protein shake, yoghurt or dessert. Traditionally it is used in hot drinks and warm foods and therefore tastes great in hot milk and warm cereals like porridge. Note: To start off with we recommend 1/2 a teaspoon for several days until your body adjusts and then over time build up to 5 teaspoons. Warning: If you have a partner and you are taking lots of maca we recommend that your partner also take maca as it can be a potent aphrodisiac - if you are concerned about this then just reduce the amount you are taking. I've tried the maca and it adds a semi-sweet pleasant flavor to the overall taste of shakes/yogurt/cereals. I had finished my first order and a week later started getting sick (I don't get sick often). Not sure if it might be related to the immune system benefits but it's worth a mention. Have just ordered another bag and looking forward to more of the taste! i have been using professional whey for a few years now for my supplements, the products are of a very high quality, in particular the maca powder, and best value for money I have come across. Another great thing is the speed of delivery, every order has come within 1 - 2 days. very happy using Professional whey. I really like this product. I have read a couple of reviews talking about the taste and smell but I found no major issues in being able to cope with it. I put one teaspoon in my smoothies every morning and mixed in with banana, berries, protein powder etc - you don't really taste it. Service, delivery and information is great - I love it that I order it in the evening and pretty much get it delivered the next day. Will definitely be getting more of this stuff as I've found it's had a positive effect on my focus during the day. This is a great value MACA product and organic as well. It tastes much like other MACA I have tried and I have been adding it to my protein shakes for the added vitamins etc. It can clump a little if used with cold water but overall I haven't had any problems with it. Benefits ... hard to tell for sure. I probably need to take it more regularly. I actually don't mind it sprinkled over rice. I must say the taste is absolutely balls whether with water or milk. That being said when I take it I feel great. If you mix in with protein and a few other ingredients it tastes ok but takes a bit to get used to starting off. Best price going for it also. Thanks PW. update on Macca. The taste is still a problem. I had started to adapt but after stopping consumption to test effects it was hard to start again. A tough taste. Futher athletic testing is proving it has no perceivable effect. Its main benefits (for me) are the way it helps clear stress and anxiety from your mind. Somehow when consuming it one remains in control, clear of mind and therefore overall wellbeing improves significantly. Wish it tasted better ! Consumption of Maca definitely takes some 'adaption' of ones taste buds or clever masking tricks ! I initially found it gave me a small endurance lift with my cycling but its main benefit to me is its 'mind clearing' effects. Its a little difficult to describe: It assists focus, concentration and takes lifts the mind fog which you can get from stress and overwork. Longer term it may have other benefits but this review is only after consuming 500gms over a few months. This is the exact same product that is available in health stores. I did a shop around in the Brisbane area and the best price I could find was $10 higher. Good find. I recently bought the Organic Maca Powder and the delivery was very prompt. First up, I was surprised at the smell - not impressed at all. I wondered if I'd done the right thing in ordering. However, after using this for a few days, my taste buds have become adjusted to the taste. I'm now enjoying the flavour and would need to wait a few weeks before any actual benefit is noticed. I'm keen, so will definitely keep using Maca. This is the 3rd brand I have tried and I'm happy to say I will stick with it - the quality & value for money is awesome!! 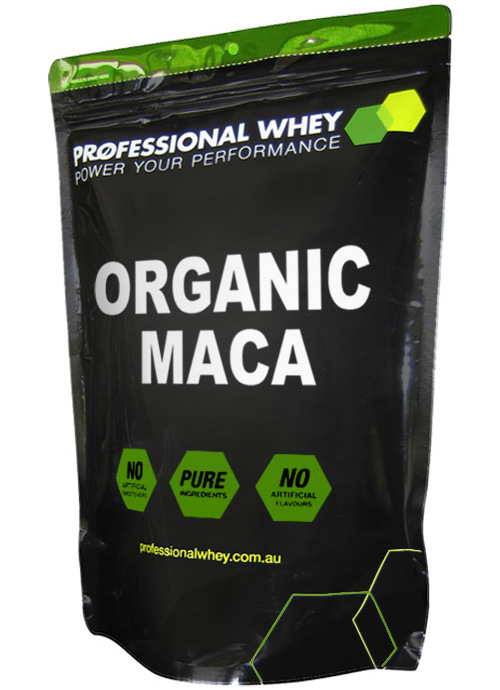 Organic Maca is a super food and you can't beat the prices from Professional Whey. I found out about it fro the American tv series DR Oz and he recommended it for everyone. I love this stuff, and for the price, this organic maca is fantastic. Delivery was quick, and my hair, skin and nails have never looked better. In fact, this is one product I can't live without. And I am happy to have found this site.